Just a few days ago, we reported that General Motors had to stop sales on 60,000 crossovers because the labeled fuel economy ratings were wrong by one or two miles per gallon. And just last month, lovable losers Mitsubishi got in trouble for messing with tire pressures to get better MPG ratings, a few years ago overstated fuel economy numbers cost Hyundai a ton of money. All these guys cheated or made mistakes for 1 or 2 MPG because our current rating system is stupid. One or two miles per gallon is within the realm of error of MPG testing, yet these companies thought a specific number was important enough to try and game the system. And that’s to get to a number they can use in advertising that doesn’t really mean what we think it means, anyway. The problem is that a long time ago it was decided that we needed one number, one easy-to-advertise and compare number, to describe how far a car would go on a gallon of fuel. 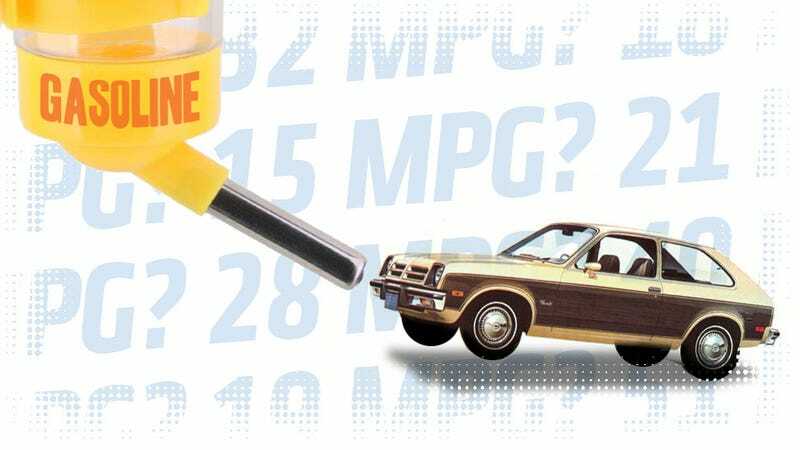 It wasn’t even until the oil embargo of 1973 that formalized fuel economy ratings were even bothered with, and by the 1980s MPG ratings became significant selling points for cars. Manufacturers featured the MPG numbers in their ads—it was realized one number wouldn’t really do the trick, so we got one for city and one for highway—and for the next decade or so, we mostly accepted that those values were accurate. Today, though, almost all new cars have in-dash displays capable of showing a car’s real-time and average MPG, and very often those numbers don’t match what is on the window sticker. That means that everyone, not just those of us who got off on doing long division, could find out what their MPGs actually are in the real world. Sure, today we’ve added a third number, a combined average of the city and highway numbers, but really we’re still rating MPG as a solitary value. And that’s the problem. The idea that two numbers (or, one “combined” number) give an exact idea of the sorts of fuel economy you can expect from your car is, frankly, ridiculous. The idea that two numbers (or, one “combined” number) give an exact idea of the sorts of fuel economy you can expect from your car is, frankly, ridiculous. Fuel economy is absurdly hard to really measure with any degree of accuracy or consistency. The EPA actually does try very hard to get accurate numbers with their complicated testing procedures. Our own David Tracy goes into their whole process here in detail so you can see what I mean, but the truth is that a solitary value for MPG is a fiction, or, at best, only true for one specific set of driving conditions and for a particular driving style. Now, the EPA is aware of this, of course, and they say as much on their Your Mileage Will Vary page because they know that, yes, of course your mileage will vary. There’s no way it can’t vary, because there are so many different factors going on when you drive, and all those factors change, all the time: wind direction, tire pressure, weight in the car, temperature, road conditions, incline, driver adrenaline levels and on and on. That’s why I think the EPA should abandon the city/highway/combined MPG rating system (even with hedge words like ‘up to’) in favor of an MPG range value. For example, my mother has a 2014 Fiat 500, one of those 1957 Edition ones, in mint green. It’s adorable. It’s an automatic, and she drives it like you’d drive a car through a roomful of kittens: slowly and gently. And honking a lot. That Fiat 500 is rated at 27 city/34 highway, 30 MPG combined. My mom routinely gets 30 MPG in the city, and 35-37 on the highway, because she drives like a saint. I drive like an idiot, so I’d probably get 23 or something in the city. This would be based on rigorous testing still, but here’s how it would work. On one end you have people who drive hard, or put a lot of load on the car, or generally the worst case (still real-world plausible, no tow a yacht with a Fiat kind of thing) scenarios. The other end would be ideal (but still real-world) conditions, with a driver actually trying to be efficient. Not hypermiler-levels, but conscientious. I’d bet a Fiat 500 would have a range of something like 22-38 in these circumstances. With the MPG range system, there would no longer be a need for ridiculous recalls and lawsuits for 1 or 2 MPG, because we’d all admit from the start that a variance of a few MPGs is completely normal. Sure, there would be a lot of testing to get reasonably accurate ranges. You’d want hot-weather testing in a 101 degree Arizona summer with the A/C on full blast, and you’d want sub-zero testing where every fluid is slowed to a barely-viscous sludge and hybrid batteries can’t hold a charge even if you handed them a bucket. It’s a lot of testing, but it would be real-world testing as opposed to runs on the EPA-style dynos. Plus, cars are already tested by their manufacturers in extremes of temperatures, so why not use that recorded MPG data from those tests? I know they have it. Developing test cycles that can give actual, real-world MPG range numbers wouldn’t be easy. But one way to do it could be to crowdsource the data. Essentially, real-world customer driving patterns from existing and competing vehicles for each class of car would be used to determine plausible test cycles and extremes of range. Customers in the fifth percentile getting 6 MPG from their cars would be candidates for the worst-case end, just as drivers in the 95th percentile pushing 40 MPG in a Cherokee would have their driving patterns duplicated for the best-case end. The key is to use as much real-world driving data as possible to come up with the testing, and, ideally, updating the numbers as new data is collected. It may prove to be more work, and it’s not a perfect idea yet, but the result would be better data and a much more informed car-buying public. Car companies couldn’t advertise high MPG numbers with an idiot or charlatan’s confidence. Also, people would go into the process of buying a car knowing that to get the MPGs they want, they’re on the hook, too, since how you drive is such a big factor. It’s just a more realistic approach that factors in reality instead of a few magic numbers. Right now, many (possibly most?) non-gearheads see that MPG number and just assume that’s what the car gets, period. That’s not the case, has never been the case, will never be the case. So why do we keep pretending like that’s how cars work with our absurd system of having three numbers for MPG handed down from the Gods of Economy? Let’s get rid of the stupid city/highway/combined rating and implement the MPG Range rating system. It’s more accurate, easier to understand, and a better fit for the real world where, my research tells me, nearly 95 percent (plus or minus five percent) of cars actually drive.